Less than 12 hours after a rock had allegedly smashed a window pane of the bus in which the Australian cricket team was returning to their hotel in Guwahati after inflicting a crushing 8-wicket defeat on India, the police here picked up two youths in connection with the incident. Assam chief minister Sarbananda Sonowal – a former sports minister of the country – on the other hand described the incident as “unfortunate” and asked the state police chief to institute a high-level inquiry. The incident has attracted worldwide attention after Australian opener Aaron Finch tweeted a photo of a broken window pane of the Australian team bus after the second T20 against India in Guwahati on Tuesday evening. The Australian opener suggested that a ‘rock’ thrown at the team bus while they returning from the newly-constructed Barsapara Stadium to the hotel in Guwahati. “Pretty scary having a rock thrown through the team bus window on the way back to the hotel! !,” said Finch in his tweet. His tweet almost immediately picked up by the media across the globe, prompting Assam chief minister to direct a probe. Later in the day, a press release issued by the CM’s office said, “This incident, which has occurred at a time when Guwahati is emerging as a sports capital has affected the city’s image, unfortunate and condemnable. The police investigating into the incidents and the culprits will be soon arrested and punished,” It also said that the chief minister has directed DGP Mukesh Sahay to investigate into the incident and asked state chief secretary VK Pipersenia to submit a report on it at the earliest. The CM’s office press release issued also quoted an AFP report which quoted a Cricket Australia spokesman saying that the Australian cricketers satisfied with the levels of security provided. “The AFP report has appeared in several web editions of international newspapers. As per the AFP news, a CA spokesman told the news agency they were ‘satisfied with the levels of security provided’,” the press release said. Assam health, finance and education minister Himanta Biswa Sarma – who also happens to be president of the Badminton Association of India – on the other hand expressed “deep apology” and promised to punish the guilty. “Our deep apology. People of Assam never endorse such behaviour. We will punish the guilty,” Sarma tweeted in response to Aaron Finch. Meanwhile, sports minister Rajyavardhan Singh Rathore has claimed that the stone-pelting incident did not reflect on the security situation in the country. “Guwahati stone throwing incident is not reflective of our security measures. Australian Team and FIFA are content with those. India remains a graceful host,” he said in a tweet. Two separate groups of sports enthusiasts on the other hand gathered outside the hotel where the Aussies had put up, and also outside the LGBI Airport in Guwahati, carrying placards saying Sorry to the visiting cricket team. 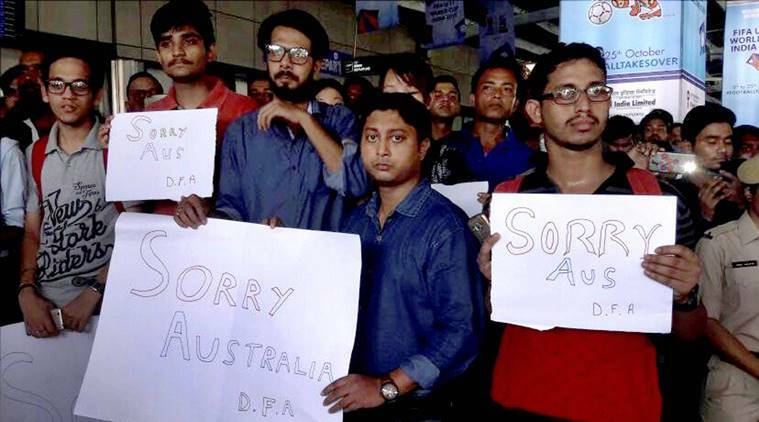 Over 100 college students and youths who had gathered outside the departure gates of the airport also chanted “Sorry, Sorry” as the Australian players alighted from a bus and walked into the airport in Guwahati on Wednesday morning. Be the first to comment on "Attack on Australian team bus: Two held, CM Sonowal orders probe, Guwahati says Sorry"